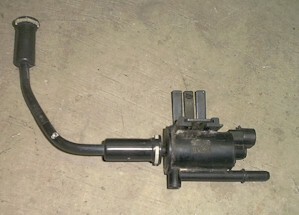 I have procured a used TBI fuel tank sending unit for use with the TBI gas tank. I have also purchased a Walbro GSS340 High Pressure fuel pump that I will be using to maintain the required 58 PSI fuel pressure. 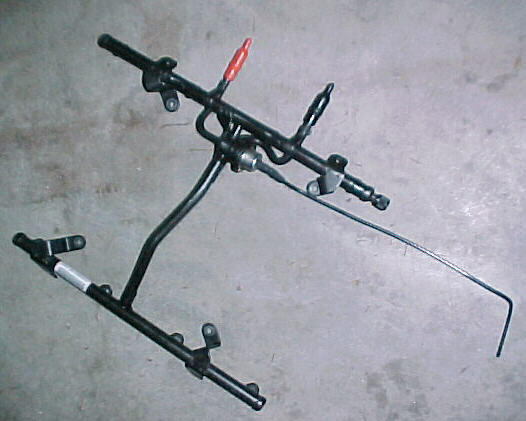 I recently picked up a '97-'98 Corvette LS1 fuel rail which has two fuel lines on it, one accepts the fuel from the tank and the other is a fuel return line with a built-in fuel pressure regulator in it as opposed to the stock F-body fuel rail which only has one line on it. 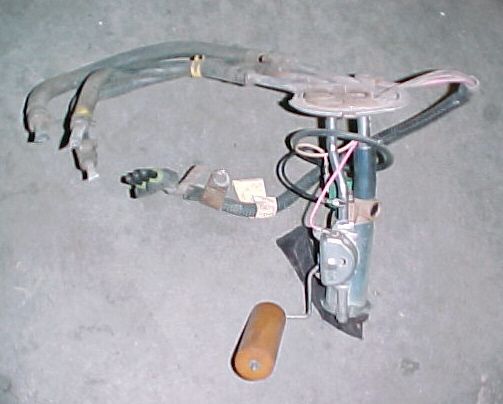 The C5 unit will hopefully make the fuel connections and regulation easier since the F-body has its regulator in the tank and is computer controlled along with the fuel pump pressure. I don't plan to use this feature of my F-body PCM. The LS1 is now sitting in the car on its own weight (without engine hoist!) on 1/4" thick wood plates (drivers side view, passenger side view) simulating the thickness of steel plates that I will use as the motor mount abutting surface to the frame. 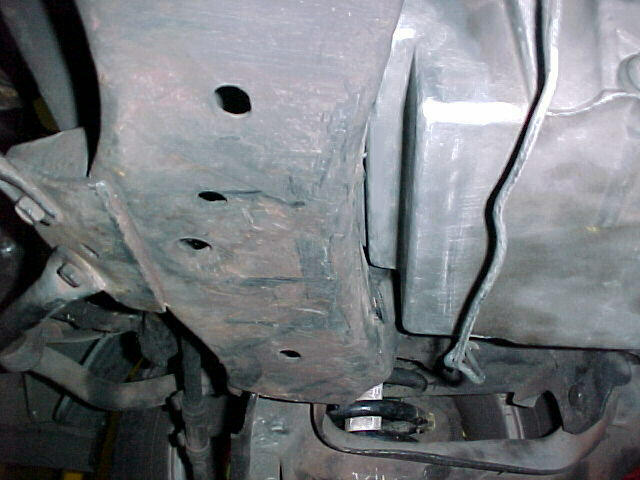 This pic shows the excellent oil pan clearance! I also used a "hollowed out" TH200R4 empty case to help establish the exact rear engine height for motor mount purposes and side to side location. The T56 is just too heavy to man-handle in and out of the car at this point. I finally dropped of the template for my new hybrid hydraulic clutch pedal at a local fabricator to program an Abrasive Water Jet (AWJ) to machine cut the exact pedal configuration. Should have the complete proto-type finished within 7 to 10 days I hope! 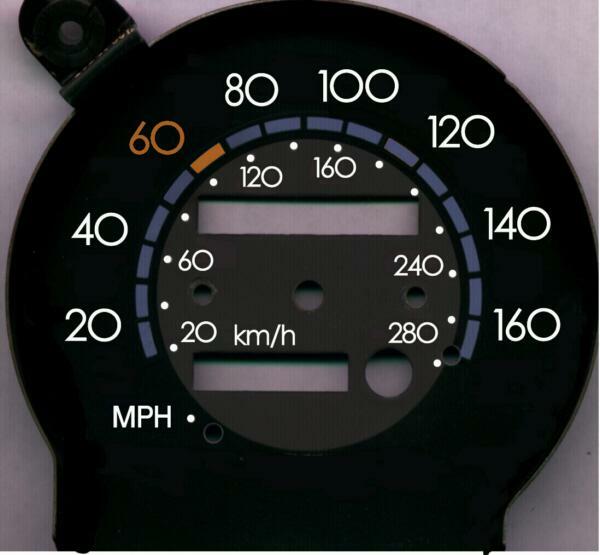 The 160 MPH speedo face turned out to be a bust because the Speedo Shop couldn't get a proper calibration on it. My only two other options using the stock speedo dial are 140 MPH or 200 MPH. I have decided to create a 200 MPH face, however, I am struggling a bit deciding between two dial faces which indicate either 190 MPH or 200 MPH using the same basic 200 MPH calibrated face. Grrrrr, too many decisions to make! My big effort this week and next will be to get the motor mounts finished up and fit-up the T56 with the proper hole locations for the shifter. Yikes! I guess now I finally do have to cut up some sheetmetal! I will also be building the final configuration of the transmission cross-member using the kit I purchased from Chris Alston's Chassisworks, Inc. Thanks to the work done last week I was able to mark-up the exact location of the reworked F-body LS1 engine mounts on the 1/4" wood pads and transferred this data to a plastic mounting plate template. I fabricated another mounting template this time using a piece of clear 1/8" thick Lexan plastic. I contoured the edges to match the approximate rear configuration of the engine saddle where it will bolt to the frame. Why did I choose clear plastic.....simple, I wanted to be able to see the existing frame holes underneath the template and be able to drill exactly through the template and these existing holes. I found three existing hole locations were suitable and will only need to drill one new hole through the frame for the 4th location on each side! The plastic template was left with the metal fabricators today to use the AWJ to cut a set of 1/4" thick steel versions with mounting holes. 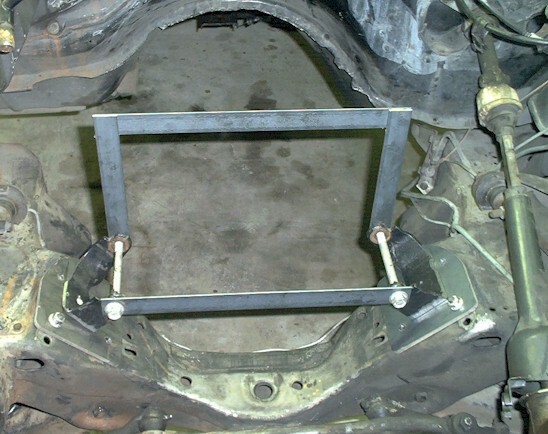 The F-body engine mounts will then be welded to these plates after one final test fit-up. I dropped the gas tank to begin retrofitting the necessary fuel lines, filter and TBI gas tank. The neighbors thought I was crazy, however, I had to roll the car out of the garage and wash it! It has gotten pretty dusty in the garage from all of the sawing, grinding and sanding going on around it. Work is also proceeding with the 2nd oil pan configuration. It is currently cut per my latest design and will be welded in the next day or two. Should have pics by this weekend I hope! You can tell things are beginning to get serious! Two WebPages updates within a week! Just picked up the 2nd design modified oil pan and all I can say is NICE! The fit and finish of the pan is absolutely sweet! 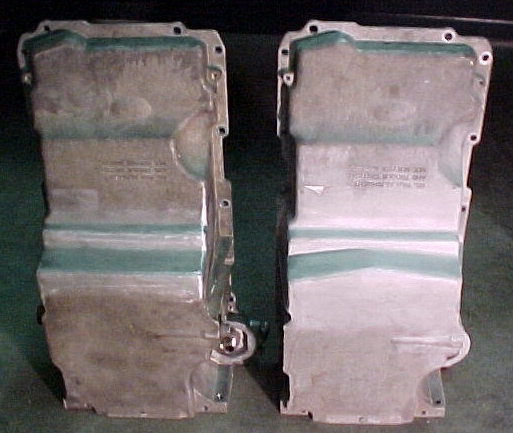 Here is a comparison between the 1st and 2nd design oil pans with the 2nd design pan pictured on the right. The new pan fit-up in the chassis at the rear of the engine frame saddle is awesome! 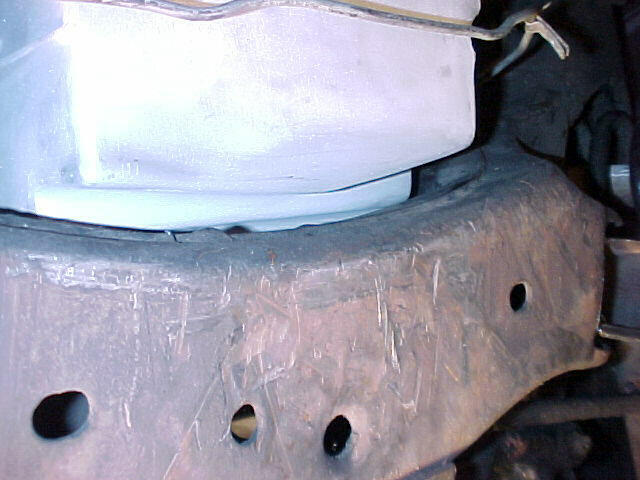 This view shows a solid 1/2" to 5/8" continuous contoured clearance as seen from the drivers side of the pan at the rear of the engine frame saddle. The major difference in the pan designs are twofold. The notch is now contoured to specifically match the G-body engine saddle frame. It does a lot as far as the aesthetics is concerned because now you know this pan was made to fit this chassis, however, and more importantly than outward appearance the forward portion of the notch on the 2nd design pan now allows use of the stock position for the oil pick-up tube! Zero mods required to the oil pick-up tube now! 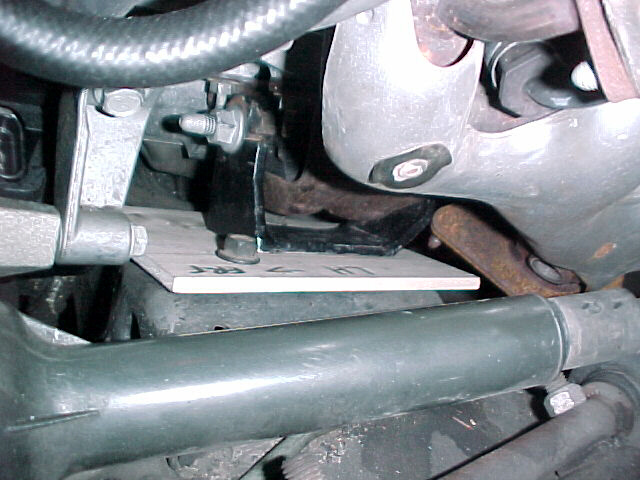 The oil pan baffle tray must also be modified to clear the notch in the pan. 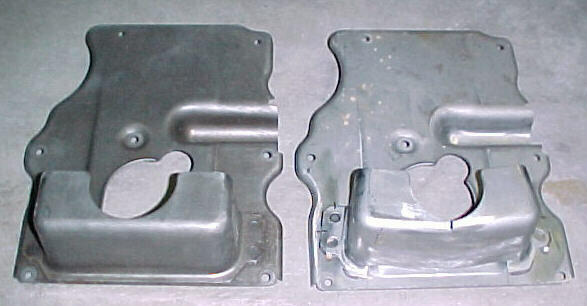 Here is a comparison between the stock baffle on the left and the proto-type modified version on the right. I should have the metal motor mount pads back from the fabricator by the first part of next week. I will begin reviewing cuts to the floor now for the T56 shifter placement. After reviewing options for connecting the C5 dual line fuel rail that I will be using I stopped by a wrecking yard this weekend to review OEM G-body fuel line configurations. My car currently has a 3/8" fuel line and 1/4" return line both located and running the length of the passenger frame channel. Since I plan on also using the '97-'98 Fuel Rail Covers (FRC's) to make this ugly duckling of a motor look presentable I will need fuel lines on the drivers side. I found that the Olds & Buick G-body's have a 3/8" drivers side fuel line. Just what the doctor ordered! 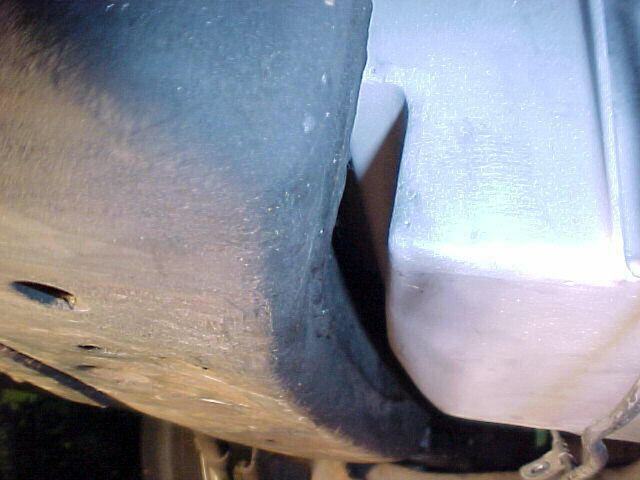 I disconnected a complete 3/8" fuel line from the fuel tank to the fuel pump on a mid-80's Regal which had the driver's side fuel line. 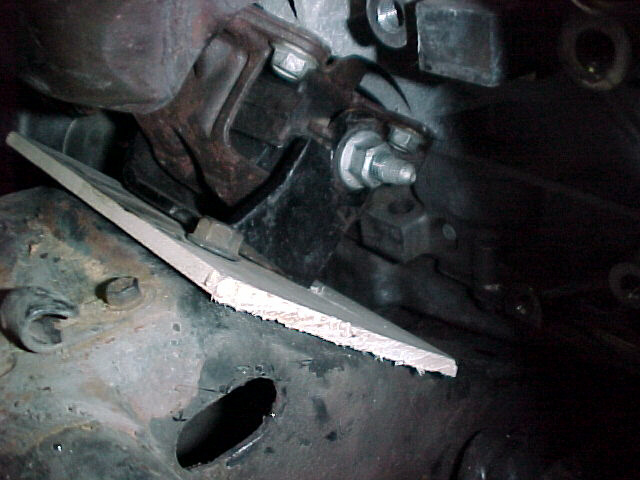 In order to get the line out of the car, I had to cut it near the front of the lower rear axle control arm. This is where I will double flare the lines and add an OEM TBI/EFI type steel in-line fuel filter. 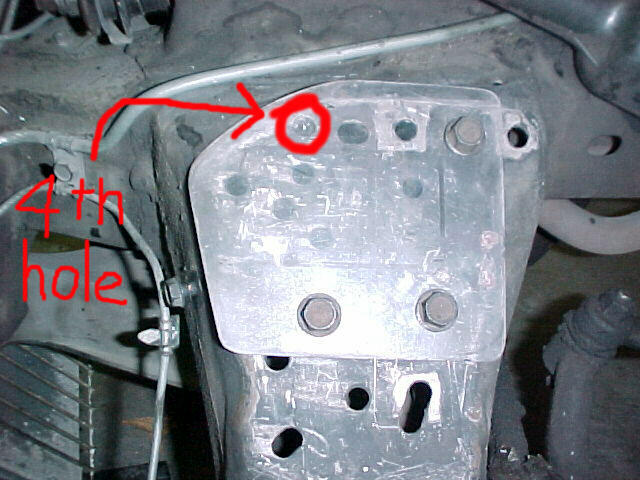 I already have the bracket for this out of the TBI Monte Carlo which I got the gas tank out of. Since I will be needing a 5/16" fuel return line I plan on using the current Monte Carlo 5/16" fuel vapor vent line which is already located on the driver's side and runs to the carbon canister on the drivers front fender next to the radiator. 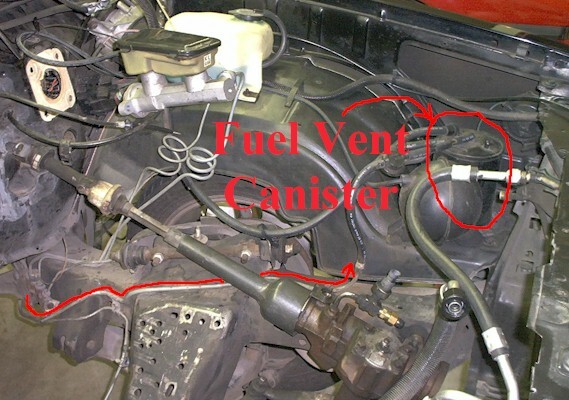 I also disconnected the Regal's fuel tank vapor return line from the gas tank to the carbon canister since it is routed on the passenger frame rail and runs across the engine saddle frame terminating at the exact same location as the Monte Carlo. I will use this line in place of the stock Monte Carlo one since I plan to connect my existing canister to the LS1 EVAP Canister Purge Solenoid vacuum line. Hopefully you will see marked improvement in the digital image quality from now on. I finally broke down and bought a new 1.3M pixel digital camera for $100 to get better picture quality. I picked up the pieces from the metal fabricator this week and went to work with the final fit-up of the motor mounts and tried the new pedal in the clutch fixture. To facilitate the final motor mount configuration on the new mounting plates I welded up a coordination template first out of 1/8"x1-1/4" plate to precisely locate the two motor mount holes in relation to each other while still on the motor. I used a 1/2" drill bit for the holes which are 15" apart from bolt to bolt centerline. Next I fabricated another locating template out of another piece of 1/8" plate with the same 1/2" diameter holes so that I could use the F-body motor mount bolts to create what a motor mount fixture for precise locating of the F-body lower cast steel motor mount pieces that I had previously cut in half for my application. 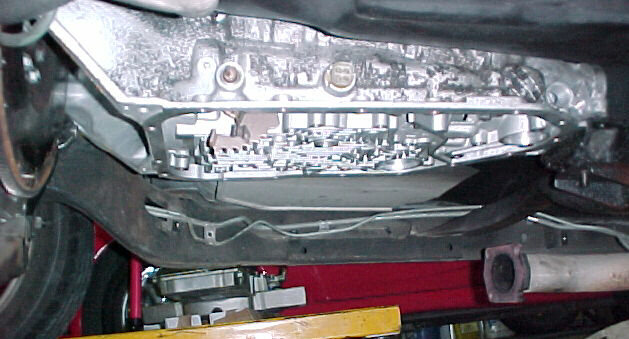 Here is an angled view of the motor mount fixture which shows the motor mount plates bolted in place with two of the four bolts through the frame. After transferring the reference front to rear locations of the mounts from the wooden templates I went ahead and temporarily tack welded the steel motor mount towers to the plates which are bolted to the frame. I will have these now fully welded and the motor mounts will be finally complete, whew! I re-installed the motor again (I can't even count the number of times this thing has been in and out by now!) and I am please to report a perfect fit! 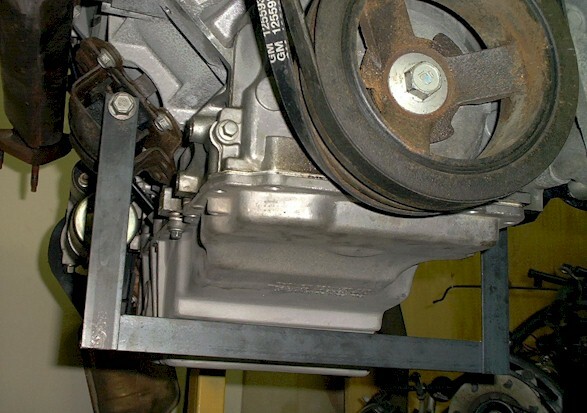 Not only in relation to the block mounts but also side to side at the rear of the 200R4 trans fixture that I am using. I got out the tape measure to verify measurements and the motor sits in the same centerline location of the stock L69! I drilled and tapped the new clutch pedal arm that I designed specifically for the hydraulic clutch so that I could temporarily bolt it up in the bench top clutch fixture. I still have to put a radius bend in the pedal face before I permanently attach. 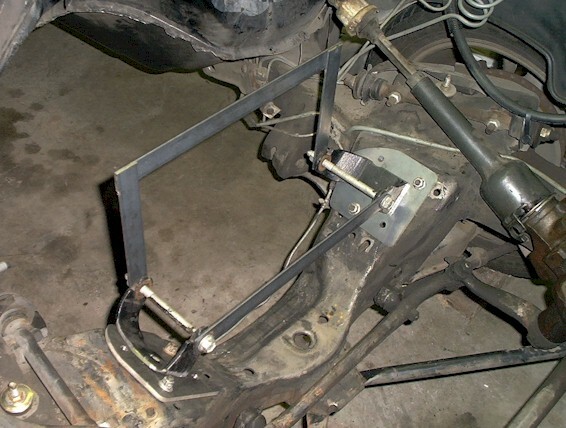 I also have to figure out a better weldment with bushing for the top of the pedal arm than the OEM set-up with cheap plastic parts which wear too quickly and have too much lateral side to side play in them. 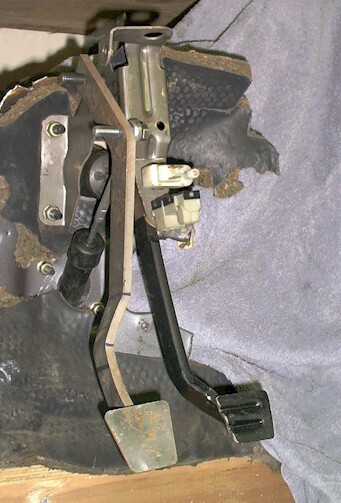 I also received the original clutch pedal adapter bracket for the hydraulic clutch which I designed for use with the stock G-body pedal for use with either a SBC T5 or LT1/LS1 - T56 from the metal fabricator this week. 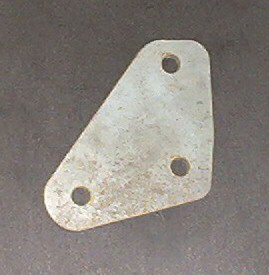 It is fabricated out of 3/16" plate which was cut on an abrasive waterjet for a real nice cut. I ran a limited production run of 5 of them. For those interested I will sell these for $20 each (I'll include shipping) until they are gone. Please e-mail me if interested. 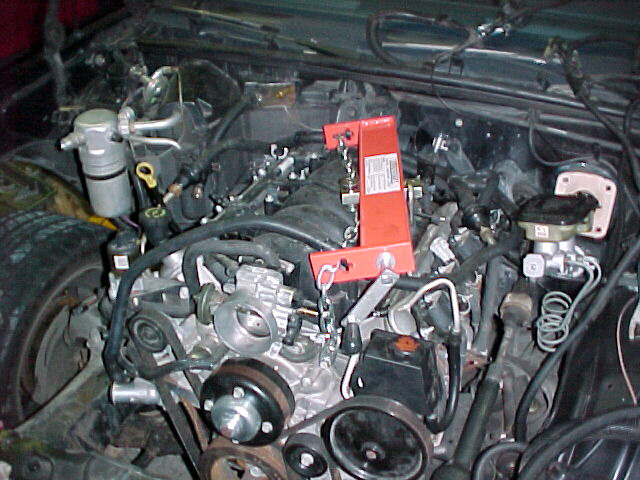 With the success of the 2nd design F-body LS1 oil pan the labor required to modify the oil pick-up is no longer needed. This will result in a $75 price reduction so for those interested in a true bolt-in G-body LS1 oil pan the new price will be $250 + shipping (~$25 depending on location)!